Love, romance, proposals, and weddings are the stuff of fairytales and happily every after's. As well they should be. But when you really think about it, getting married is perhaps the biggest business decision of your life. In a perfect world, every marriage would last "Till death do us part". But that simply is not the case considering over 50% of all marriages end in divorce. Knowing this, entering into a prenuptial agreement can be one way to bring security and peace-of-mind to a relationship bound for the alter. Perhaps they were once considered appropriate only for the affluent. However, prenuptial agreements are becoming more commonplace as people seek to protect their assets and income from being divided in divorce court. In fact, 63% of attorneys have seen a rise in the use of prenups over the last few years (according to a recent survey of the American Academy of Matrimonial Lawyers). Indeed, more couples are now considering prenuptial agreements as a form of marriage insurance. Should your happily ever after turn into your own version of hell on earth, you can both rest in the knowledge that you will walk away with your finances still intact. Just like any business contract, both parties involved need to know that their best interests are being served. That is in fact what a prenup ensures. Provisions of a Prenup: For some, the term brings to mind notions of mistrust, "doomsday," or even a code by which to punish ill-behaved spouses. Prenuptial agreements, however, are legal contracts that clarify and protect what you each came into the marriage with financially. They can be instrumental in reducing conflict and reduce legal fees in the event of divorce or death, by establishing procedures and ground rules. 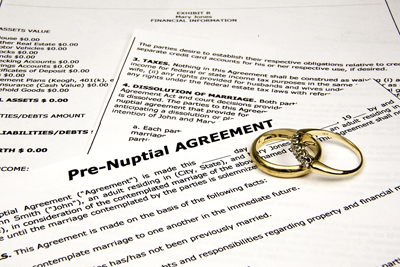 Prenups can help: 1) Identify and protect ownership of "separate" pre-marital assets; 2) Define what is "community" property; 3) Clarify any division of debt; 4) Outline any special arrangements like retirement benefits, or supporting a spouse through advanced schooling; and 5) Provide for estate planning in blended families with children from previous marriages. Although to some it may seem unromantic to hash out in advance the finer points of any life-change, these contracts can bring security to those who enter in with considerable assets, or who have been married before. Important Considerations: Naturally, the terms must be mutually agreeable and set forth in writing. Also, the contract must be based on full/fair disclosure at the time of execution, and it must be acknowledged and signed before a notary public. Both parties will want attorneys to review the contract to ensure their interests are being served. Although all 50 states recognize prenups, it may not be necessary if you are married in a "community property" state. In this case, state law may already legally provide protection over separate assets and non-responsibility of debt accrued outside the marriage. While this is not an exhaustive list, couples may want to include provisions wherein: a significant asset is being protected; there is full or part ownership of one or more businesses; valuable retirement benefits or stock options have been earned; the protection of inheritance for children outside the marriage is a concern; or, death benefits or estate planning needs to be defined. Prenups can also outline any special conditions, like how a couple will manage money and property during the marriage, or whether financial support will be paid or waived in the event of divorce. Again, we strongly suggest seeking legal counsel can help initiate the process. Relational Benefits: In a recent Harris Interactive Poll, 49% of divorced people and 44% of single people felt having a prenup was a good idea, while only 15% regretted the decision. Writing a prenup may be a good idea for some, and it can be a positive experience. Namely, it can help improve communication because it forces couples to be in tune with and empathetic to their spouse's concerns about finances, property, and other practical matters. Couples can strengthen and deepen their relationships through a healthy exchange-talking openly about important issues. These discussions can help eliminate misunderstandings as couples address their needs and work through some finer points and conditions. Furthermore, making decisions together on the terms can show a willingness to be open-minded and supportive. Ultimately, if a couple can approach this lovingly and constructively, it stands to bolster communication and unity. Bottom Line: It is not atypical to be facing divorce, true enough. And these days, couples are either getting married (or remarried) a little later in life, when debt, assets, and children are often a part of the equation. With more at stake than say a young adult just starting out, it is sometimes appropriate and wise to enter into a prenuptial agreement to define and protect yourself and your finances. A healthy marriage should be based in part on open communication. Drafting a prenup allows both parties to put their concerns on the table to work through in the spirit of cooperation and support. Through the help of attorneys, couples can gain peace-of-mind knowing they have legal protection in the event life takes a wayward turn.